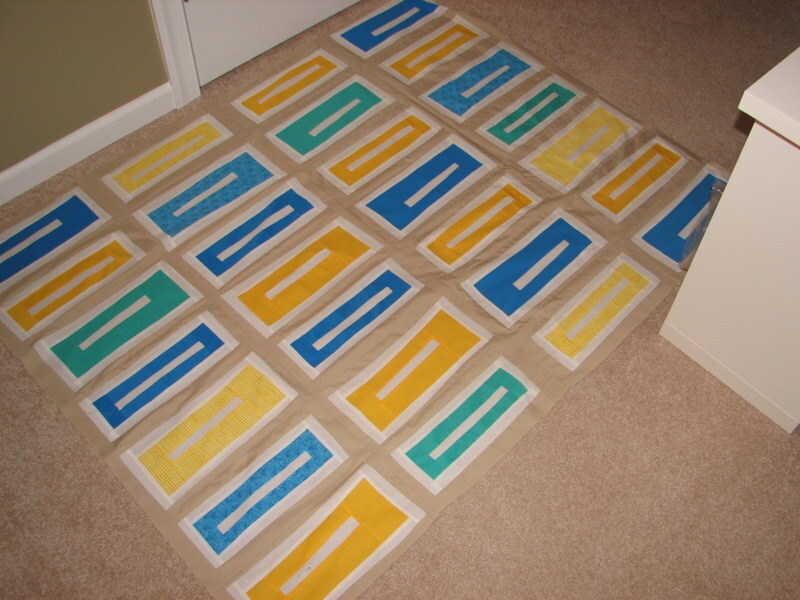 Other posts on this project: Crete Quilt, Crete Quilt 2, Crete Quilt 3, Crete Quilt 4, Crete Quilt 5, Crete Quilt 6, Crete Quilt 7. So what I actually did was measure all the squared blocks until I found the shortest and narrowest measurements, which were 16″ and 7.5″. The blocks in the original Ice Pops quilt from Denyse Schmidt’s book are 17.5″ by 9.5″. So I’ve lost overall 14″ of width and 6″ of length. I’m definitely going to have to add more pieces to the border, which I’d already cut larger to take this from the full quilt of the book up to a queen, if I keep going with this as a queen size quilt. Or, I may decide that the extra measurements I cut into the border pieces make this work as a full size quilt and leave it at that. But that’s not exactly practical for my in-laws, since this is supposed to be for their house in Crete and I don’t think it has a full bed anywhere. 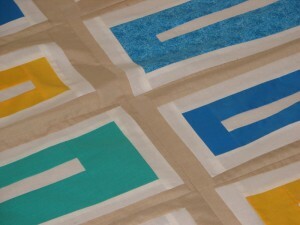 Or I could skip the borders completely and make it a throw/lap quilt kind of thing. I’m still deciding about whether I want to quilt this myself. The one in the book is hand quilted, which I think would drive me insane at this point. I run out of patience putting buttons back on, hand-quilting something big I cannot get my mind around.